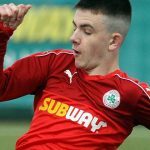 Barry Gray paid credit to both sets of players for serving up an entertaining game despite the stormy weather conditions that dominated Cliftonville’s defeat of Ards yesterday. After missing an early penalty at a rain-lashed Bangor Fuels Arena, Joe Gormley provided the cross that forced a David Elebert own goal before converting a Rory Donnelly delivery to put the Reds 2-0 up inside 10 minutes. Donnelly’s own goal reduced the arrears ahead of Levi Ives wrapping up the points when he found the bottom corner early in the second half to ensure a third consecutive Danske Bank Premiership victory. “After getting into a dry change of clothes, I think the players can be pleased with a job well done,” says Gray. “You have to give credit to both sets of players. It’s easy to criticise, but it was horrible out there and both Ards and Cliftonville gave it their all and put on an entertaining game for the fans. I don’t think it was a day where anyone wanted to be outside. 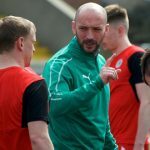 The win marked Cliftonville’s third away day success of the campaign, leaving Gray to remark: “Everyone keeps telling me about our poor away form, but I think people underestimate how difficult it is to win games on the road in this League. “Ards are a prime example of that, as no one gets it easy here despite their League position. We scored three goals and defended well, so I’m really pleased. 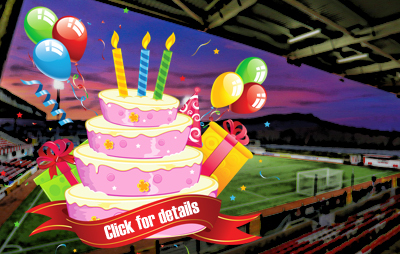 You can hire Solitude for Birthday Parties?